Paradise Air Inc is proud to serve the Flower Mound community! About Flower Mound, TX - Happy to be your hometown Heating & Air Conditioning Contractor! Flower Mound is a Texas town located in portions of Denton and Tarrant Counties, and as of 2010 the population was approximately 64,669. Flower Mound was incorporated in 1961, and after the DFW International Airport was constructed four miles away in 1974, rapid growth was experienced. 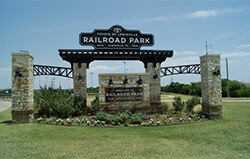 Two major economic developments are located in this town: the Denton Creek District and the Lakeside Business District. These areas provide economic and job opportunities to the local residents, and most children are served by the Lewisville Independent School District. This city is part of a humid subtropical climate zone with hot summers that typically reach the mid-90s. Winters are mild with temperatures in the low-50s. Flower Mound residents value outdoor recreation, so there are numerous opportunities to get outside located in this community. Some of the most popular include Aqua Kids Swim School, Circle R Ranch, Leonard Johns Park, and Northshore Park. Family attractions include the Indoor Safari Park and the Flower Mound Pumpkin Patch, while adults looking to relax may prefer an afternoon at Bridlewood Golf Club or catching a show at the Flower Mound Performing Arts Theatre.